The customs of the Navy are so many varied and ancient that we can only touch lightly on them for example, up until the present day we find that coins are still put in a ship, under the step of the mast when she is built. The former Royal Yacht Brittania is a case in point. This custom possibly dates from the Romans, who had a habit of placing coins on the mouth of a person when being buried so that he might pay his fare to Charon when ferried across the Styx. Coins were possibly put into ships so that in the event of sudden disaster those drowned would at least have their passages prepaid. The use of the Boatswain's pipe is lost in antiquity, but we know that the ancient galley slaves of Greece and Rome kept stroke by the flute or whistle. The Pipe or Call was originally used as a badge of rank also and as such was worn by the Lord High Admiral and known as the Whistle of Honour and was made of gold, and suspended from the neck by a gold chain. Officers also carried a Whistle of Command, which was of silver, and was used for passing orders and blown as a salute to certain personages. It was enjoined that it should be blown on these occasions 'three several times'. Commander Boteler, of the STUART period, has much to say concerning it; Shakespeare mentions it, and Pepys makes a few remarks about it, and as we go back in history we find continuous references to it. The first time where it was found to be used actually to pass an order was during the Crusade of l284 when the Crossbowmen were piped to come on deck and engage the enemy. In the action between Lord Howard son of the Earl of Surrey, who, as Lord High Admiral, was killed in action with the Chevalier Pregent de Bidoux on April 25th, 1513, off frost, we are told that, when be observed that his capture was imminent, he threw his Lord High Admiral's whistle into the sea. His Whistle of Command was found on his dead body. In the old days when Captains were frequently called onboard the Flagship when at sea, and in weather too rough to permit the use of the sea gangways, it was customary for the Captain to enter and leave his boat by means of a Bosun's chair on a yardarm whip, and he was hoisted out and hoisted in, and the requisite orders were passed by pipe. The present call for piping the side is, although much more drawn out, very similar to the call used for ‘hoisting and walking away', and as it was ordained that the pipe or call should be blown as a form of salute, it is thought that the origin of piping the side dates from this practice, as it is customary for the Officer of the Watch even now if the Captain is reported coming alongside to give the order Hoist him in - notwithstanding the fact that the gangway may be available for use. When speaking of Piping the Side it may not be out of place to observe that this form of salute is reserved expressly for certain persons and is an entirely nautical honour. The relevant orders are laid down in QR & Al's, and the actual calls used in HM Service are shown in the Admiralty Seamanship Manual, Vol 1. No Military Officer, Consular Officer or other civilian is entitled to this form of salute. By the custom of the service a corpse of any Naval officer or man is piped over the side if sent ashore for burial. Admirals of Ports and Vice-Admirals of the Coast are offices held, as sinecures, whose legal functions have been merged into either the Admiralty of other Government department and whose rights were abolished by the Municipal Corporations Act of 1835. These officials, as such, are not entitled to be Piped over the Side of HM Ships and they hold no Military Commissions. At the funeral of the late Queen Victoria and King Edward, The Side was piped as the coffin was lowered and at both funerals the Navy with a gun carriage was responsible for the conveyance of that coffin during the last part of the journey. It is believed that this was due to the fact that at the funeral of Queen Victoria the Artillery horses got somewhat out of control and a Naval Field Gun's crew was substituted. At Portsmouth there is kept a special rubber-tyred limber which was used at the funeral of King Edward and it is believed kept expressly for State funerals. · Monday night - Our ships at sea. · Tuesday night - Our men. (as no one is likely to concern themselves with our welfare). · Thursday night - A bloody war or a sickly season. · Friday night - A willing foe and sea room. · Saturday night - Sweethearts and wives. · Sunday night - Absent friends. On Saturday night it is customary for the youngest member of the Mess to be called upon to reply on behalf of "The Ladies". The date cannot be traced when the privilege of sitting to drink the health of the Sovereign was accorded to the Navy. Some say that it was WILLIAM IV and others say that it was CHARLES II., who, on returning to England in 1660 onboard the Naseby, which had been re-christened the Royal Charles, bumped his head when replying to a toast, and ever afterwards held Naval Officers excused from rising to these occasions. To sit when drinking the Loyal Toast is not permitted when the National Anthem is played. This is in accordance with the ruling given by the late Marquis of Milford Haven, on June 4th, 1914, at which date he was First Sea Lord. The custom of imposing penalties for making a bet or mentioning a lady's name prior to the loyal toast was instituted so that argument should not become heated nor quarrel take place while the proceedings in the Mess were still formal. 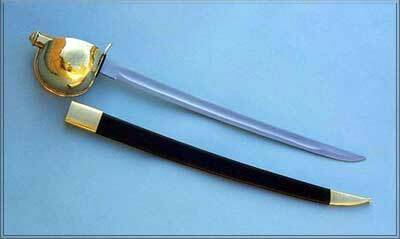 Similarly a fine is imposed on anyone who draws a sword in the Mess without previously asking permission to do so. The object was to avoid any hasty action particularly in the days when duelling was prevalent. It is still considered bad manners to enter a strange Mess while wearing a sword, and was discountenanced in order that no aggrieved party should come onboard with the intention of forcing a quarrel at all costs. A dispute between two men could often be amicably settled if these precautions and customs were observed in accordance with the instructions contained in QR & Als., (Queen’s Regulations and Admiralty Instructions) where a unique reference is made, namely, “Any Officer who shall act as herein denoted and consequently refuse to accept a challenge will be deemed to have acted honourably and to have evinced a requisite obedience not only to this order, but also to the pleasure of the Queen”. WILLIAM IV was the last holder of the title of Lord High Admiral, which he held when Duke of Clarence, from may, 1827, to August 12th, 1828. 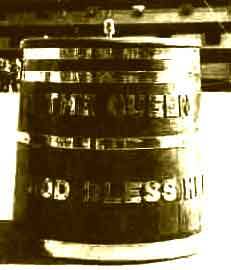 The origin of the motto, The King, God Bless Him', on the Grog Tub, is probably due to the fact that many men used to drink their tot as soon as it was issued and toasted the Sovereign while doing so. In HMS Cadmus, in the summer of 1913 at Hankow quinine was issued three times a week. It was issued in a large bottle and the Cups were placed in a bowl of disinfectant on the capstan head. The lower deck was then cleared and, commencing with the Captain followed by the Officers and the ship's company, everyone took his tot and toasted the King. It was often customary in the Army when quinine was issued daily on certain stations for the regiment to parade and for the senior officer to toast the Sovereign with his draught, thus ensuring that all officers and men took their medicine out of loyalty if not out of obedience. If no one partakes of the wine for the drinking of the Sovereign's health the Mess President is entitled to a glass ‘Down to the Mess', so that all may share in giving proof of their loyal sentiments. No member other than guests may accept a glass of wine for this toast, it being a point of honour to pay for it oneself. It is still customary in the Army and in Royal Marine messes for the President to remain seated until the last member has left the table, and the decanters should be stoppered prior to 'The Queen' and remain unstoppered after The Queen as long as the President is sitting. A President who leaves the table without either stoppering the decanters or delegating his authority lays himself open to the customary fine. In strictly conducted messes this custom is observed in the Royal Navy. The reason for stoppering the decanters prior to the Loyal Toast is to imply that it is solely for this that the wine is provided and that it is no longer required after all have filled their glasses. In former times the Officers of HM Yachts were messed by the Board of the Green Cloth, which is actually the Lord Steward's Department. When this custom was done away with a sum of 5/- (five shillings) per diem was paid by the Board in lieu of messing. This was changed to 5/- per diem when H.M. was afloat, then to 3/- per diem, and lastly to 3/- per diem and 2/- for Warrant Officers when the Standard was flying, and in this form it still exists today. The records of the Board of Green Cloth at headquarters do not go back beyond 1893 and consequently without reference to earlier records elsewhere it can only be stated that the allowance has been paid continuously at the latter rates since that time, although it is known to be of much earlier origin. The Officers serving in HM Yachts made a practice of standing when drinking the Loyal Toast. It is understood that this is merely to emphasise the honour and distinction of serving in the Royal Yacht. The late Marquis of Milford Haven, when First Sea Lord prior to the war, drew attention to the fact in Admiralty Orders that, although the Navy had the privilege of sitting when honouring the Loyal Toast, they did not have the privilege of sitting when the National Anthem was played. In order to retain the privilege many ships did not play the Anthem. The First Sea Lord, from his position, had the strongest grounds for drawing attention to the matter, and it is well understood that these orders are in strict accordance with Her Majesty's wishes and with the custom of the service. The order was dated June 4th, 1914, and read The underlying idea is that whenever the Anthem is played, when the Sovereign's health is proposed, everyone stand up. If it is not played, people remain seated'. In fact, the Admiralty from time to time since 1914 have brought out most stringent regulations ordering that everybody should stand on all occasions when the National Anthem was heard, but our prerogative of sitting whilst drinking the Sovereign's health has never been questioned. Salutes of all sorts and descriptions are as old as history. Ships' salutes in the days of sail were carried out by striking or lowering topsails, by letting fly the sheets, and by firing of guns. Mr. Pepys informs us of how, when the news of King Charle's declaration came to the Fleet in the Downs, The General began to fire his guns, which he did, all that he had in the ship, and so did the rest of the Commanders, which was very gallant, and to hear the bullets go hissing over our heads as we were in the boat'. The firing of guns in the olden times was responsible for a most prodigal waste of ammunition and the practice has been greatly curtailed. Dressing ship and manning ship is as old as the time of Queen Elizabeth, and the ceremony of receiving a Royal personage, as described by Commander Nathaniel Boteler in the reign of CHARLES I., is almost exactly the same as that prescribed in the present year of Grace. The ship salute is said to have been, enforced in the Narrow Seas by King ALFRED and EDGAR. King JOHN certainly issued a decree that it was to be accorded. Professor Callender states that the demand for the salute in the Narrow Seas cannot historically be conceded prior to EDWARD I., who claimed both sides of the Channel and consequently the intervening sea. 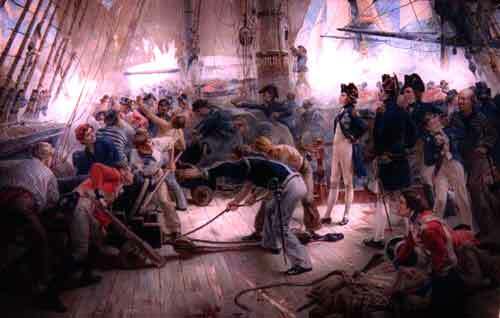 The fact of shortening sail or letting fly sheets inferred that the person saluting was willing to place his ship at a disadvantage in the matter of speed, and the firing of guns denoted the fact that he was temporarily unarmed on account of the time taken in those days to reload the cannons. 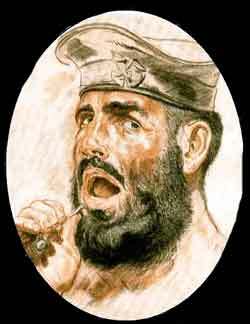 It was customary when in harbour for the cook always to have a red- hot poker available for the firing of salutes. The insistence by British vessels of the Flag being saluted led to the Dutch War. In May 1652, off the Start, and on June 8th, 1637, off the Lizard, our claim (Royal Navy) to the salute by Dutch Men Of War was enforced by action. On the early occasion the Captain of the Dreadnought, one Henry Stradding, went so far as to lodge the Captain of the Dutch Rear Admiral's Flagship in Plymouth port for the neglect of what Stradding considered to be his duty. In retaliation for the incident of 1652 Tromp was so infuriated that he flaunted his flag off Dover and attacked Admiral Blake, and after these preliminaries the first Dutch Wars commenced. Nowadays, though there are no written regulations stating that Merchant ships shall dip to Men-o'-war, the Admiralty consider that this is an act of courtesy, and in accordance with AFC 172/29 desire that the non-observance of this custom by British Merchant ships shall be reported to My Lords. On entering a foreign port in the days of sail, after a salute to the country and the Governor had been fired, it was customary to run up the jib, or loose, hoist, or let fall the foretopsail at the first gun, and furl or pick it up on completion, or if topsails or topgallant sails were set (as the old expression was), to veil them when saluting any Sea Officer of the Admiral of the Port. This privilege wasn’t accorded to dignitaries who were not connected with the sea. Many high dignitaries were compelled, by cannon shot, to salute the English flag in various seas. Among others may be mentioned King PHILIP of Spain when visiting queen MARY in 1554; The King of Denmark when returning from visiting King JAMES I.; a Portuguese Ambassador, and numerous ships of war, the Commanding Officers of which were in some cases tried in the Admiralty Court and their ships were detained during the proceedings. Not believed to have originated due to the belief that there was originally a crucifix there as we find that in former days when the Quarterdeck was saluted it was customary for all officers present there to return the salute by uncovering, and this leads one to think that it was not the crucifix that was saluted, but the fact that the Quarterdeck was the seat of authority and the position nearest to which the King's colours were displayed. It is not thought that any Navy custom which is based on saluting the crucifix would have survived the many religious upheavals to which the country was formerly subjected. Sir John Jervis made it a practice, even when addressing an inferior rank, always to remain uncovered. Queen VICTORIA instituted the salute in the Navy as opposed to uncovering. The occasion being when she sent for certain officers and men to Osborne to thank them for rendering help to a distressed German ship and did not like to see men in uniform standing uncovered. The personal salute with the hand, although borrowed from the Army, is full of interest and various theories have been evolved concerning its origin. There is the usual theory that it has been the custom from time immemorial for a junior to uncover to a superior, and even today men of the Brigade of Guards remove their caps instead of saluting when wearing fatigue dress. The holders of this theory maintain that the present salute is merely the first motion of removing one's head-dress. It was officially introduced into the. 1~Jtavy in 1890, but during the war a large number of old retired officers were in the habit of doffing their head-gear instead of saluting, this, of course, being the method to which they were accustomed. In a book called ‘New Art of War', printed in 1740, it is stated that - When the King or Captain General is being saluted each officer is to time his salute so as to pull off his hat when the person he salutes is almost opposite him'. Another tradition is that the salute and its return were given as mutual tokens of trust and respect, so that when two armed men met they both raised their viscrs, thus laying themselves open to attack. The old head-dress being clumsy and not easily removed, the preli4nary movement of the salute was considered sufficient. That the hand is kept open is probably a relic of' very ancient times and denotes that no weapon is concealed therein. The salute with the left hand was abolished in the navy in the year 1923, so as to bring our customs into line with our allies and also to conform to the practice in vogue in the Indian Army. Both on the continent and among Indian and African troops a salute given with the left hand was considered a gross insult. The Salute with the sword is undoubtedly of very ancient origin, but there are certainly two schools of thought concerning it. Some hold that it is of Crusader origin and that the position of the recover is symbolical of the act of religious homage wherein the cross hilt of the sword was kissed as representing the crucifix, and that the holding of the sword at arm's length represents the bailing or acknowledging of the leader, and the sinking of the point into the ground betokens an act of submission to superior authority. The other school only differ, it is believed, regarding the origin of the ‘recover’ position and affirm that it is derived from the oriental custom (still existing) of shading the eyes from the magnificence of the superior. It cannot be said which belief is more correct, but the latter was, as believed, that which was taught some years ago at the Royal Military Training Colleges for officers. It is noteworthy that the only straight bladed, cross hilted swords still in use in the services are those of the Scottish Archers undress swords of the Highland Regiments, Midshipmen’s Dirks and Landsmen. When an officer is tried by Court Martial, prior to the judgement being delivered his sword is placed on the table so as to have the point towards the prisoner if he has been found guilty and with the hilt towards him if he has teen found not guilty. This custom is the equivalent of the old practice on shore where the executioner, currying his headsman's axe, immediately preceded the accused on his return from the Court to the prison and in order to demonstrate the judgment of the Court turned the edge of the axe towards or away from the prisoner, depending on whether sentence of death had been passed or not. When decapitation ceased to be the extreme penalty in England and was superseded by death by hanging it was at one time the custom for the executioner to tie together the wrists and thumbs of the prisoner by means of a short cord in order to intimate to the public that the prisoner was under sentence of death. In the event of an acquittal the hands were left free. A rogues Salute or One Gun salute is the signal gun fired to denote that a Court Martial is about to assemble to try a case under the Naval Discipline Act. If the Court assembles onboard one of HM ships the Union flag is flown at the peak halliard while the Court is sitting. In olden times it was customary to fire the signal gun in order to muster the hands of all ships in company to Witness a yardarm execution. A yellow flag was hoisted at the same time and kept flying until the sentence had been carried out. When Keel-hauling was recognised as a punishment a single gun (sometimes shotted) was fired over the head of the delinquent as he emerged from the sea in order to astonish and confound him'. Due to the severity of the punishment this additional discomfort would appear to have been unnecessary, as the unfortunate culprit had in all likelihood lost consciousness. The practice of receiving senior officers and others on entering a ship is very ancient and used to be attended with much pomp and ceremony. In fact, at one time, no matter what hour of day or night the Captain returned to his ship, all officers were expected to attend to welcome him, notwithstanding, as one quaintly remarks in his memoirs, ‘Though he should be drunk as a beggar'. As a rule the sea gangways were used by junior officers in harbour and by everyone at sea, weather permitting, the accommodation ladders and entry ports being barred in. It is curious to find even as late as 1914, that ships still existed with the second or third step of the sea gangway made longer than the remainder. This is to enable the man ropes to be held out to the person boarding the ship by two men specially stationed on the long step for this purpose. The step being extra long, these then were clear of the gangway, and the expression “Manning the Side'” became a literal fact. Articles in the QR & Al lay down the orders for the conduct of a junior officer in a command meeting with a senior officer in Command, and direct that providing the state of the weather permit, he is to wait on such senior officer, to show all the orders which are not secret that he is acting under, and inform him of the state and condition of the ship or ships under his orders, etc., etc'. In accordance with these regulations it is customary and good manners for the junior officer to ask the senior officer's permission to proceed in execution of previous orders should the meeting take place at sea and the junior be on detached service. In harbour the junior officer is expected to enquire at that time if it will be convenient for him to visit on his superior and then make a formal visit at the time specified.